Photographers, Horsham. Chart & Co. took over the studio of Mrs Henry Aubrey at 41 West Street during 1905 or early in 1906. They did not stay long, handing over to Arthur John Lyle in 1909 or 1910. A John Chart was a stationer and toy dealer in North Street from before 1903 to about 1910, but whether he was connected in any way with Chart & Co. has not been determined. Chart & Co. published halftone cards of bands from various towns that played in a March 1906 competition at Horsham, but it is not known if they produced any other cards. 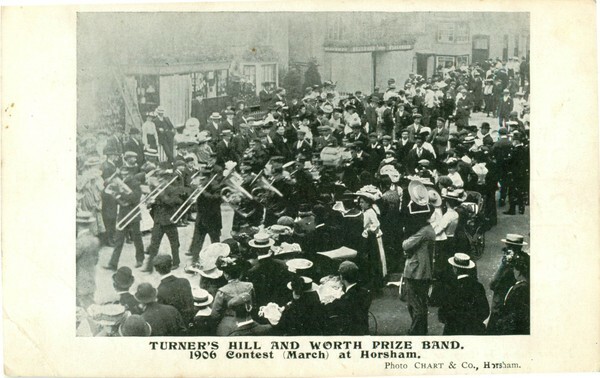 A halftone card of the Horsham Town Band in 1905 marked "Aubrey, Horsham" was presumably published by Mrs Aubrey herself.